They say ‘time’, and how you spend your time, is the greatest asset of our lives. Such a simple saying says little but echoes plenty about how Jonathan & Katrina’s lives have come to this solemn moment, their very own wedding day. Having been high-school friends for well over eight years, the seed of friendship that had been sown and planted so long ago had grown to become a magnificent arbour. Indeed, Jonathan & Katrina’s long-lasting relationship finally turning over a new leaf was a very special moment to say the least; and one which our videographers and cinematographers had the utmost privilege and pleasure of filming. Our story begins on the couples’ fateful morning. A sentimental letter reading of notes exchanged between the two on their most special of days. A hallmark card for a ‘hallmark’ occasion, and a sharing of jokes between the couple reflected just how close the bond truly is between Jonathan & Katrina. 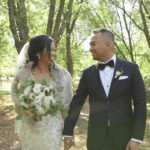 Our videographers and cinematographers had chosen to specifically feature this moment in the Same-Day-Edit highlight reel, as the newlyweds’ interaction, even through letters, truly brought out the best between the two. Come the big moment down the aisle, and the couple are as bright and effervescent as ever. 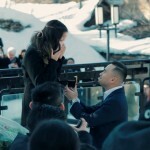 Sealing their fates with many kisses, and a surreal memory captured on camera, Jonathan & Katrina had finally embarked on the journey of a lifetime. Through it all, our videographers and cinematographers had caught many memorable moments through our lenses; the couple and their entourage’s proud pose, several scenes set at ‘The Berkeley’ event hall, and a beautiful ‘first-look’ scene of the bride and groom’s morning meeting and a dramatic first kiss truly made the highlight reel magical. 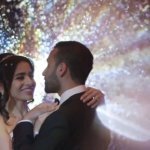 Our videographers and cinematographers luckily had filmed up to the earliest moments of the newlyweds’ night-time celebration set at Toronto’s Claireport Place Banquet & Convention Centre. A haughty entrance coupled with a captivating first dance, Jonathan & Katrina did plenty to give plenty of perfect scenes to use for our videographers’ Same-Day-Edit. And to sum it all up, the Same-Day-Edit featured to finalize the newlyweds’ evening was a smashing hit. To quote a remark from our special highlight editor, Katrina couldn’t help but swell up at the moving footage from earlier in the day, and several guests had given props for the fine work. In closing, you can find Jonathan & Katrina’s special review for us below. In the end, we here at SDE Weddings, Toronto’s premier wedding videography, cinematography and photobooth group, had an absolutely fantastic time filming and preparing Jonathan & Katrina’s footage on their wedding day. We hope Jonathan & Katrina have a wonderful life together, and that our ‘gift’ for them in our work may remain alongside the two as a precious token of their special day. My wife and I could not be any happier with SDE. […] The reason we went with SDE is because [they were] very flexible with pricing and open to negotiation of services. […] The one service my wife absolutely wanted was the Same Day Edit. This feature usually makes a HUGE dent in the wallet from what I’ve seen from other price lists of other vendors, but I guess this feature is just something that Yang and his team are used to creating with no issue, therefore don’t have a massive price increase for it. This actually surprised me because Yang actually had someone specially designated on-site for editing only. The SDE crew did a great job from beginning.